"A remarkable thing about The White Road and Other Stories is that for all that there are over twenty stories in this collection, each character possesses a distinct voice, molded by childhood histories and informed with deep-rooted desires and loves. Where the story concepts begin with science, fiction becomes a laboratory for examining the most intimate secrets of the human heart," says Ilana Teitelbaum. Read the full review. "The collection is inspired by articles from science magazines but Tania, a former science journalist, creates her own utterly original and often beautifully surreal interpretations of the science prompt. From the striking title story to the magically unusual Rainstiffiness, each story has something unexpected and weirdly wonderful. As a reader I read in open-mouthed awe and joy, as a writer I writhed with envy. This is a must read collection...."
"...I think this collection works because the flash pieces are interspersed between the longer stories. I have a few books that contain nothing but flash and I find them hard work en masse like that. So what did move me? Well for me it was the title story as I’ve said. It’s not long – 7½ pages, a touch over 2000 words – but it was the perfect length for me. I recommend you read it right now. It’s online here. That way you won’t feel that I’ve ruined it for you when I talk about it. Go on. Do it just now. I’ll wait. ..."
The first type was easy to recognize and crave: that quick pow of an image or feeling that lingers long after an investment of only minutes of reading. When I first read Tania Hershman’s The White Road and other stories, I did not feel that pow. I confess the collection bored me, and later I remembered only two or three of the longer, more developed stories. The good news is that by the time I plucked the collection from my shelf again, I was much more open to another type of short story experience: the brief, in-the-moment pleasure that comes from beautiful prose. The White Road became engrossing on second read. The even better news is that the allure of this pleasure warmed me up to some major pows that I had somehow missed a year before. Now I can whole-heartedly recommend these stories...."
Whether you’re a fan of short stories or not, do yourself some good and get hold of a copy of Tania Hershman’s The White Road & Other Stories. If enough of us do that, then maybe Salt will ask her for another collection and that would be a very good thing indeed. "The eponymous story of this collection is worth the price of admission. It is, without a doubt, one of the best short stories I’ve ever read. A woman, at the end of the world, who has endured the loss of a child but more than that, seen his dead body, that death from his own hand, and so she finds a way to see nothing but bright white ever again. I was genuinely moved and shocked by this story. So remarkable.....The one constant through each of these stories is the care Hershman has taken with her characters. This was a collection that was written with love. "This collection exemplifies everything that is best about the short story. With succinctness rarely seen in the work of someone new to fiction, Hershman extracts the very essence of a moment to reveal the poignant fragility of human relationships. ...Extremes of weather is a recurring theme, as is parenthood, but each story is so different from the next that you are tempted to read 'just one more' until you find you have read the whole book in one sitting. " Heart is one such moment. It is probably the shortest story in the collection but it has stayed with me the longest because I am still there with that heart in my hand and then the cold wine glass. I feel what the surgeon feels. I am her. I don't need any more. I don't want any more." "The White Road is a very fine collection, containing enough wonder and humor and heartbreak to overflow its slim pages, forcing the reader to share in the great emotion contained within. Hershman's talent is obvious, and I look forward to seeing it continue to grow across whatever new stories and new books might follow this excellent start." 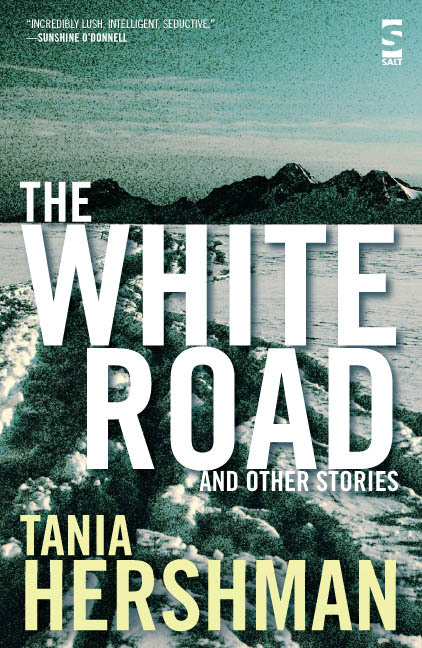 "Just started reading Tania Hershman's The White Road and other stories, and is blown away by the originality and piercing prose. And for someone who doesn't normally choose short stories, that's very special." The short short story is Hershman’s preferred form, and there are some very short shorts in this, her debut collection. For the most part her experiments are a resounding success – in fact, for this reader, she is at her most effective when at her most concise. ‘I am a camera’ comprises two short paragraphs which say everything that needs to be said, no more, no less. Find out more about The Frogmore Papers. "Many of Hershman’s stories dwell on loss, despair, frailty and weakness – on the human drive to face these obstacles and overcome them or at least carry on living in their wake. Hershman adds more variety by countering the science-inspired stories with flash fiction, most of it lighter, more humorous fare. “Heavy Bones”, for example, is a quick, amusing look about reversing roles on a wedding night tradition. The White Road may not be hard-hitting short fiction but it shows there is more than one way for writers to separate their work from the pack of safe and boring mainstream writing. Props to Hershman for showing readers that not all short fiction is dull and formulaic. " "Hershman's other strength is her ability to keep the reader on her toes. She weaves the warbly, neon threads of magical realism together with the steel rods of science, and the effect often is very satisfying. In ths story "Self-Rising," a woman whose career in the laboratory is derailed by the arrival of marriage and children opens a cake business that specializes in "lab cakes," cakes shaped like DNA or test tubes or petri dishes. Despite the seeming-cliched "making lemondade out of lemons" plot, Hershman crafts an ending that is both fantastical and touching. "Sunspots" and "Rainstiffness" are equally imaginative and lovely. "This collection of short stories takes as its theme the edgy and sometimes difficult relationship between humanity and science. There is a great deal of energy about the stories, as well as a strong and distinctive voice. Not all main characters are sympathetic but, then again, they're not meant to be - and each one does have a gripping issue to raise or an arresting tale to tell. ..."
"Hershman is an interested, dreaming science observer who pays serious and at times myopic attention to sci-tech news stories and considers what they might mean...."
"Very enjoyable. ... The themes cover parenthood (or lack of it), loss, and some aspect of science (usually), these elements are blended well with elegance and grace. Many are set in cold climates but the book as a whole has a warm and cheering heart." "This slim volume ... contains stories with colour, life, passion, precision and pathos. The shortest is just half a page but it packs a terrific punch. You could read the whole collection in one sitting but I recommend taking your time, allowing the stories to sink in, get under your skin and sing."